Put down that shovel! Move away from that plant! You were going to move it again, weren't you? You just don't like where it is. You have decided that another plant would look better where that one is planted, so you'll just casually move that plant to make room for the new one? Or maybe you just didn't think it through when you planted it in the first place, and now the plant is over crowded or maybe it clashes with other nearby plants. For whatever reason, you have your shovel in hand and you are ready to just dig up a plant and move it. Wait! Look at what can happen! I speak from experience that a plant moved too often can be stunted and fail to reach its potential in any reasonable timeframe. This is supposed to be a really large leaf hosta, one I got from my sister two years ago. I originally planted it where I now have the miniature garden. When I decided I wanted this miniature garden in this spot instead of the big hosta, I dug up the hosta and put it in a container, and made it live in that container through the winter. Then I transplanted it to its current location last year, and there it sits. Oh, it's a tiny bit bigger than last year, but it is not even close to how big it was when I brought it home. 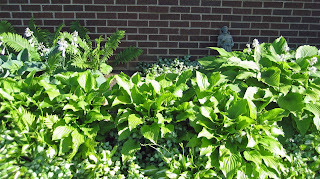 I've heard that some hostas can take up to six years to recover from transplanting before they reach their mature size. And while I wait for this one to stop pouting over my obvious disregard for its needs, I have this gap in my hosta border. 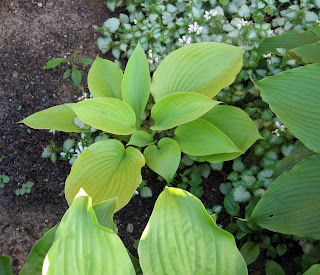 This hosta is supposed to be a big focal point in the center, toward the back. This next example may cause you to never again dig up a plant and move it. 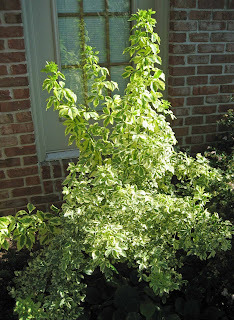 This is my Five Leaf Variegated Aralia, Acanthopanax sieboldianus 'Variegatus' It's about four inches tall and I've had it for at least nine or ten years. I swear I've only moved it twice, at most three times. But those moves have really stunted it. When I bought this, my neighbor was with me and she bought one, too, which I planted for her and we left it in where it was originally planted. Here's what hers looks like today. I know, that's quite a difference! And I've gone over there to help her trim up shrubs and personally cut this back a lot because it is so much bigger than mine. I'm actually thinking of digging mine up one more time and making a bonsai out of it. I've always wanted a bonsai plant. 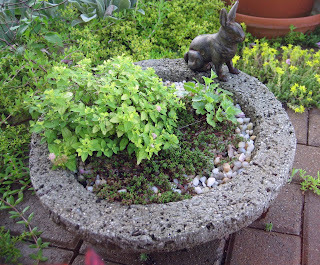 Or maybe I should put it in this dish garden with the dwarf spirea, Spiraea japonica 'Golden Elf'? Now are you convinced that moving your plants around all the time isn't good for them? Think before you plant! - Is the plant going to get the right light where you are going to plant it? - Will it have enough room to grow to mature size? - Is it compatible with the plants around it, requiring relatively the same amount of water, same type of soil? - Are you just planting it in that spot because you are tired of waltzing around the garden with it? - Is this the right time of the year to be moving a plant? 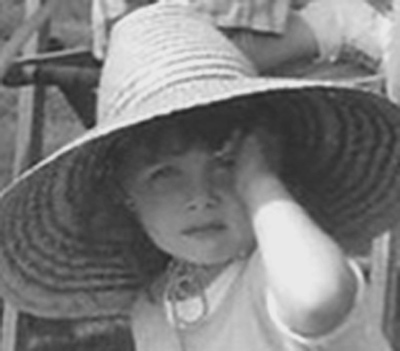 - Do you have a really good reason to dig it up, such as you are doing to divide it up or pass it along to another gardener, who can now say thank you for it? - Are you willing to risk stunting its growth for who knows how long? Put down that shovel, and think about it before you move that plant again. This is one I will never be able to manage. I like to move 'em if they need it. If they look too scrawny after the move, they can move right on over to the compost pile! LOL. Carol, threaten them with extinction and they will perform better after the move! Carol, your plants certainly offer some proof that transplanting too many times can be detrimental to their health. I try not to, but some times it is necessary. And then there are pass-along-plants. Hey, maybe that's one reason some of mine aren't doing so well... Anyway, informative and fun post- as always! When I read this, I thought, oh my, she's looking over my shoulder. I want to move some daylilies, but I'll wait and move them in September when it won't hurt them as much, or perhaps next year early. I can be down with getting over the superstition of not thanking people for plants... but I can't vote with you on this one, Carol! It's just not in my gardener's DNA for some reason, I swear! A very timely post. I've been moving things around this week: a Japanese maple, (for the third time),a lavender plant that was being covered up by the carpet rose, a huge hosta that was getting too large for the front flower bed, a balloon flower that was where I wanted the Japanese maple to go. I bought three Japanese maples at the same time, all were about the same size. I found good locations for two of them, the third one keeps getting moved and still looks about the same size as when I bought it. The other two are quite large now and are thriving in their locations. So, your theory is definitely true in this case. I think those are some good points. Just try to plan so that you don't have to move it. But if you don't plan, then you might have to move it. In fact closer to fall I think I have a couple of plant to move, but I will have to rethink that now. First I laughed out loud at the 4-inch aralia...I can relate since I have several plants that also have failed to achieve their potential! Then I laughed at the bonsai idea...bonsai is sort of a joke for my gardening friend and me...we are both guaranteed death to any bonsai...we even steered clear of them at the San Francisco Garden Show so we didn't kill any by walking too close. I never thought about that...And of course I saw this after planting a hosta from my coworker's garden "temporarily" so I didn't kill it before I had the chance to remove the grass from its planned permament spot. I'm with Layanee and Kim on this one, Carol! Maybe the Five Leaf Variegated Aralia is four inches tall not because you moved it too many times but because you didn't find the right place yet! When you move plants a lot, you usually add all kinds of soil amendments like compost to the new spot, and then you add some to the soil where the plant used to be so you can plant something else there. Perhaps constant digging and amending and plants playing musical chairs actually could improve a whole garden over time? Sometimes you have no other option but to move a plant. 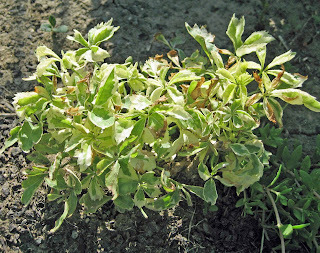 I try to move them either in the fall when they go dormant or early in the spring when they have just started to emerge. It seems to be more effective. However, I guess if we thought before we just planted something somewhere...maybe we wouldn't have to move things so often. Oh, Carol, this advice will never fly with someone whose blog is named Digging. My shovel, not a hoe, is always at the ready, and moving plants is half the fun! I love your bird bath what a great idea! Hostas are one of my top five favorite plants, we had three that became part of our family almost and were as tall as our 7 year old daughter once the blooms came up. Golly Carol, I can think about it, draw it out on grid paper, let it sit in a spot in its pot for awhile and then plant it to only a year or less possibly move it. There is just something wrong with me. Or not by the sounds of this post. Does this condition have a name?? Like 'shovelitis' or 'movesitoften'. All, thanks for all the great comments. This might be kind of a "do as I say, not as I do" kind of post, as I'm guilty, too, of moving plants around like furniture if the mood strikes me. But at least we all know the consequences and risks, right?